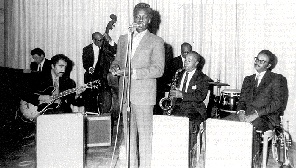 The Backstage, c. 1940s, Saunders King with Eddie Taylor on sax, Joe Holder on bass, Bernard Peters on drums, and Sammy Deane. At the Fairmont Hotel, c. 1970s. -- Saunders King singing. More than a half--century after buying his first Saunders King 78, B.B. King still beams at the mention of his name. "Saunders King. I'm a big fan of his! He was one of the first of the people that played blues and had the beautiful sound of the electric guitar. He was a great singer. In fact, he was one of the people I idolized. I especially liked 'S.K. Blues' -- still do! There was a part one and a part two to it. I also admired his 'St. James Infirmary' on Aladdin. To me, Saunders King was one of the greatest ever." Born in Staple, Louisiana, on March 13, 1909, Saunders was raised in Oroville, California, where he sang in the church choir and studied music in school. He became adept with piano, banjo, ukulele, and violin. His first professional appearances were with the Southern Harmony Four, a gospel quartet that broadcast over NBC Radio in San Francisco for several years. 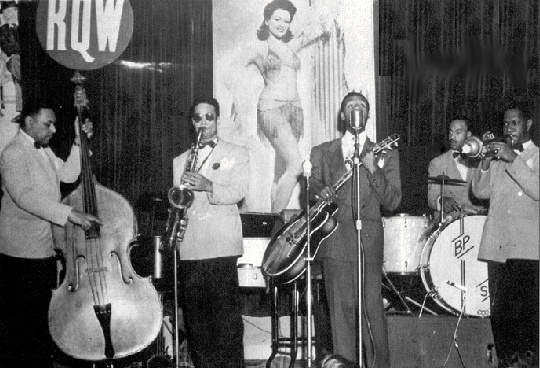 Inspired by Charlie Christian's records with Benny Goodman, King took up guitar in 1938. After working with an ensemble led by Joe Porter, he organized his own impeccably rehearsed sextet, which accompanied him during his debut session for Dave Rosenbaum's San Francisco-based Rhythm label in June 1942. I wanna whisper in your ear and tell you things keep worrying me"
You keep on mistreating me, baby, ooh, you will have no hair nor head at all"
Other standouts from King's 1942 Rhythm dates were the unbeatably smooth "What's Your Story Morning Glory" and "S.K. Groove," during which Saunders paid tribute to Charlie Christian with his comping and elegantly paced solo. During the war, while performers like Muddy Waters and Elmo James were thumping Delta-derived electric blues on Southern farms and in Chicago taverns, Saunders King was flying high, "giving out with the hot stuff" with one of the West Coast's hippest jump outfits. He was a regular at posh spots in San Francisco, Hollywood, and Chicago, toured the Southwest, and even worked the chitlin circuit. Not long after World War II, King recorded for Decca in Los Angeles, but legal entanglements prevented the session's release. He resumed cutting for Rhythm in '46, producing classic 78s such as the two-part "Lonesome Pillow Blues" and "After Hours" backed with "Why Was I Born," with its terrific guitar solo. 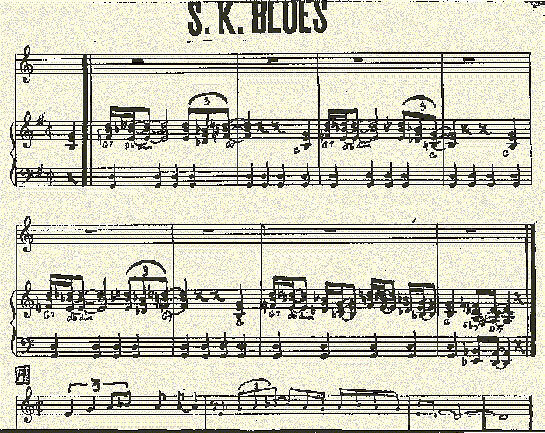 "Write Me A Letter Blues" was paired with the bop-inspired "Swingin'," one of King's finest performances. Subsequent Rhythm sessions yielded further gems: "Stay Gone Blues"/"S.K. Jumps" and "Something's Worrying Me"/"2:00 A.M. Hop." On record and stage, Saunders never restricted himself to blues, delving into swing, ballads, bebop, and revitalized readings of standards such as "Summertime" and "Danny Boy." In newspaper ads from the late '40s, San Francisco's Club Savoy billed him as part of "The Greatest Sepia Show On The Coast," listing the "suave rhythms of Saunders King" just below headliner Art Tatum. Billie Holiday came to town and shared the bill with "The Red Hot Rhythms Of Saunders King," as did Sarah Vaughan and others. Near the decade's end, the Bihari brothers purchased most of Saunders' Rhythm masters and invited him to cut new material for their Modern Records. King's first Modern offering was the ballad "Imagination" backed with "Empty Bedroom Blues," which features an early use of low-volume electric guitar distortion. Modern next paired "Danny Boy" with "Read The Good Book," which despite its title is far closer to a Louis Jordan jump than a gospel tune. The Biharis reissued the old Rhythm master of "S.K. Blues" as the two-part "(New) S.K. Blues." King's brief sojourn at the San Francisco-based CavaTone label produced a single 78, "September Song"/"Nobody Wants Me." In March 1949, a Billboard ad proclaimed, "Here he is!!! The King of the Blues, Saunders King, and Aladdin got him!" Saunders' Aladdin debut, No. 3027, was his unforgettable version of "St. James Infirmary Blues" backed with his original "Little Girl." With their smooth guitar tones and still--fresh solos, these sides are among King's most vital recordings. He continued to expand his solo style on subsequent Aladdin releases, bending strings with aplomb on "Misery Blues" and stretching out nicely on "Stormy Night Blues." Cut in a superior studio, Saunders regards his Aladdin releases as his finest--sounding 78s. By the early 1950s Saunders King's recording heyday was drawing to a close. He was in top form when he cut his potent "Summertime Boogie," released on RPM. (Issued on the Ace LP The First King Of The Blues, the unissued alternate take of "Summertime Boogie" is the more happening version: cascading horn lines bridge towards rock and roll, while Saunders' solo conjures the spirit of Charlie Christian.) In 1954 King produced a pair of memorable platters for the Biharis' Flair subsidiary, "My Close Friend"/"Going Mad" and "Quit Hangin' Around Me"/"Long Long Time." His final session as a leader, at Fantasy Records in 1961, produced stinging--guitar remakes of "S.K. Blues" and "What's Your Story Morning Glory," released as Galaxy 712. During the ensuing decades Saunders continued to play blues in nightclubs around the San Francisco Bay Area, but he increasingly devoted himself to raising his children and composing and performing spiritual music. An 1989 stroke has since slowed his musical activities. Today the 84-year-old King and his wife Jo share a spacious home in San Rafael, California. The stack of charts Saunders has saved over the years hints at the broad scope of his musical interests: Among the yellowing pages are tunes by Ellington, Gershwin, Strayhorn, Coltrane, Rodgers & Hart, Charlie Parker, and the Beatles, as well as a chart for "Silver Dreams," which King sang on longtime son-in-law Carlos Santana's Oneness: Silver Dreams,Golden Reality LP. Our interview took place on July 28, 1995, with a follow-up several weeks later. What attracted you to the electric guitar so early on? The sound. I was trying to get a sound. I traded guitars, different types of boxes. I had an acoustic Epiphone first, and the Epiphone gave me good sound. I tried the electric guitar and got a better sound. Were you aware of the electric guitarists who recorded before Charlie Christian, such as Eddie Durham with Jimmie Lunceford or Floyd Smith with Andy Kirk? Yeah. I'd go and watch Eddie Durham play. Oh, yeah. I was intrigued by the sound. Do you remember the first time you saw an electric guitar? Yes. I don't remember the year, but I remember the idea. It was at the Golden Gate Theater in San Francisco. There was a big band there playing with Alvino Rey, and I was intrigued by the sound he was getting, but he wasn't getting an electric sound. He was getting an acoustic sound. He had a large-size box, and he sat on the stage and played. I could hear him with just an acoustic box from where I was sitting quite a ways back. He had all kinds of boxes. He played one box and got one sound, and then all of a sudden he'd put it down and play another one. Alvino Rey--I loved him. He played all kinds of melodies, different intricate things, and he led the band. It intrigued me. When did you become aware of Charlie Christian? With the first Benny Goodman records? Yes. He came out with something new, something different. He had a different sound, a complete sound, a big sound. It was with the Sextet with Lionel and them guys. He was great. Did you have a favorite song of his? "Seven Eleven." But I liked everything he did. No kidding, I liked anything he did. I even liked how he'd grunt and groan. He was a good musician. Did you learn any of his music note for note? No. I didn't want to. But I loved him. It's hard to get the notes, get the sound, of what he played. It's not in the equipment. No, it's the hands. The hands is what's happening. Was Christian's "Blues In Bb" related to the song you recorded with the same title? No. My piece "Bb Blues" was just a blues, and it had different hollers. I'd sing a verse, and the fellows in the band would sing a verse. We'd call them "holler tunes." Was Charlie Christian the first guy who could hold his own alongside great horn players? He was the first one. As a matter of fact, I was working at Jack's Tavern in San Francisco, and Charlie came in. He was here with Benny Goodman's band, playing with Lionel in the Sextet, and he came in and everybody asked him to play one. We were off the stand when Charlie came in. I said, "Well, what do you want to play, Charlie?" He said, "Stardust,' man," and that was it. He played by himself; I'll never forget it on my guitar, which had a very bad pickup. He was different. He was taking a solo by himself, and he made such changes, crazy changes. In these kind of clubs I was working, we sort of played it straight, but he made all those sounds and different changes. He was great. Charlie Christian didn't fool around. Did you get a chance to talk to him? Yeah. He was a great guy. At that time, quite a bit of drinking was going on, and he had been to different clubs. Club Alabam was around the corner, Harold Blackshear's Supper Club was happening too. So naturally he went with the fellas, wherever they'd go, he would go. . .
During the '40s, what set San Francisco apart musically? We had a lot of after--hour clubs over here, like Jimbo's Bop City, and that's where the San Francisco blues and jazz came from. You went in at one o'clock, and the music was just beginning to feel good. Peggy's Chicken Shack was right next to Jimbo's place, so there was good food; that was great. Jimbo was a great guy. We'd go there and jam the rest of the night, and that's where the jazz came from, mostly. What attracted you to blues? I really wasn't attracted to blues music. I came from the radio. Jack's Tavern was the first night club I played. Who were some of the first bluesmen in San Francisco? That really played the blues? I didn't know of any, actually, because San Francisco mostly had a lot of dinner clubs. And in a dinner club, you didn't hardly play the blues. Seemed like the club owners in the Fillmore was trying to get away from the blues. They wanted class. They wanted the white shirt and tie class? Yeah! That started at Jack's. It was around the time of the war, because he had drapes over the door due to the blackout. We never saw the planes, but they were supposed to come over. The siren would go off to pull the curtain closed, and he'd have music behind the curtain and no one could see the lights. That's the way that was. Going due west from the town area, there was Harold Black-shear's Supper Club, Club Alabam, New Orleans Swing Club. And then there was another area going further away. What do you remember about your first recording session in 1942? The environment was very poor. One of the reasons was we did not have many places to record. We recorded at Sherman Clay, a music store at Kearny and Sutter in San Francisco. Did they hold sessions in a room upstairs? Yeah. A recording studio. As a matter of fact, that picture [points to the cover of his Ace LP The First King Of The Blues] was taken upstairs. That picture was taken at my first session. That's Sammy Deane and Johnnie Cooper and Eddie Taylor and myself. . .
Is it true you wrote "S.K. Blues" on a challenge? Yeah. After the session, the guys said, "We're going for a break to get something to eat." We were at the Sherman Clay, and we needed one more tune for the session. And [Dave] Rosenbaum asked me, "Can you bring another tune?" I said, "Yeah. Let me get something to eat." I was recording on Kearny and Sutter, and I left there and went out to the Fillmore District. While I was eating the food, I wrote the tune. And I had one verse too many for the tune. You needed two three-minute sides? Yes. I had about six minutes, so we filled in. And that's how "S.K. Blues" came about. I didn't even know it was gonna be a hit or anything when I wrote it. I came back and finished the session and I went home. Eddie Taylor came by and he told me, "Say, man, you know that tune might be a hit." I said, "Oh, man. What are you talking about?" "No kidding," he said. "That's a real down-home blues, and you might have a hit." Sure enough, later on we were in Texas, and when I got there it was a hit. Everybody was playing it in all those little clubs. Yeah, I was surprised. You used that line "give me back the wig I bought you." Had you heard that before? No, I'd never heard it before. So maybe he swiped it from your song. During your late-'40s tours, what percent of your repertoire on any given night was blues music? It was according to what people ask for. If they didn't ask for it, before the evening was over I'd play something. When people were dancing and making a lot of noise, they'd say, "Ah, we don't want to hear that. Play some blues, man! Play some blues!" So you did -- you'd either play it or you'd get out of there! Even in San Francisco. One of the biggest fights we ever had was behind some young girls wanting to hear the blues. And to tell you the truth, I didn't play too much blues, because most of the clubs I was working weren't blues houses. I played supper clubs, the Fairmont. Were you gigging a lot? Yeah. Five nights a week. Most people don't associate San Francisco with having a thriving blues scene back then. You hear a lot more about West Coast swing, Oakland blues. Who was the most exciting blues musician you ever saw? I don't know that I could answer that, because there weren't too many -- certainly not in San Francisco. How about on the road? Roy Milton. He played the boogie-woogie blues. The house would rock when he played--really! He followed me into Harold Blackshear's Supper Club, and we thought we were doing pretty good--until Roy Milton came along! No way. He starts blues at the beginning of the evening, right straight through. He didn't stop for anything. Now there was a guy that played the blues. Yeah. A good band. And he sang and played. But they didn't advertise that this was a blues band. You went there and you got what was played. Who was the most interesting musician you ever encountered? [Long pause] Eddie Taylor. Unknown to the public, but to me he was one of the finest and most interesting musicians I've ever met. Really was. I could be standing up playing, and he'd be next to me, and something would happen in his mind. There would be something he'd want to play, and he would play counterpoint to what I was playing. We'd play a duet together, and then he'd take a solo. I'd take a solo, and we'd cut back and do an ensemble together. He was the most interesting musician I've known. I played with a lot of musicians who said that he was not a very good tenor player, but to me he was the end. Cab Calloway tried to steal Eddie Taylor. He came to the Backstage, which was a club in San Francisco where we had been about a year. Someone had told him about Eddie Taylor, and he came to catch our matinee. He was working downtown. I found out that he wanted to hire Eddie Taylor! But Eddie wasn't going anyplace. . . Were you a fan of Miles Davis? Yeah. A buddy of mine. He would come to the apartment when he used to play at the Blackhawk during the '40s. Was Miles famous when you first met him? For whatever style he was playing. He changed often. You never could figure Miles out. One season he'd play something sweet, and the next season he'd be wild. He'd come back with a change of style. But as long as I can remember, he was always famous. With me he'd be respectful. We got along fine, beautiful. He'd sit around my house and be respectful. He was crazy about my wife. He was always saying I married a "child bride." [Smiles] My wife and I went to hear him at the Bothan on Divisadero Street, and during intermission he came out and picked me up--he was always strong!--and held me. He said, "You crazy man with a child bride!" Cicely Tyson was upstairs, and when she came down he told her that my wife was "a young child bride and she shouldn't be in here. She's underage.". . . Were you a fan of John Coltrane? Oh, yeah. When I first heard him, I couldn't understand him. Yes. But then I sat down and listened to him, and he was alright. When I could get what he was saying, he was great. He came in Jack's too. . . When you were young, did you see any of the famous blues women, like Ma Rainey, Bessie Smith, Ida Cox . . . Missed 'em all. I wasn't interested in them. Women blues singers -- I don't know, just didn't move me. I listened to them, but they didn't move me. Did you like [[Billie Holliday Busted|Billie Holiday]? Oh, yeah. I loved her. I think she's everyone's favorite. We were listening to some records the other day, and I pulled out a Billie Holiday album. We worked together in San Francisco in three different clubs--Savoy, 90 Market, and New Orleans Swing Club. Was she straight when you met her? No. But she had just gotten herself together, and her manager was my manager at the time. When she came to town, she needed someone to work with her, so I worked with her. The same thing happened with Sarah Vaughan. She came to town and needed a band, and I worked with her at 90 Market Street. How did you become associated with Louis Armstrong? Satchmo, I always liked him. I always liked him as a person. I loved him as a musician, loved a lot of things about him. Whenever he'd play, I would go to wherever he was playing and listen to him. He just had certain riffs that he'd play. If you weren't a musician, you would miss it. He'd play the same thing over, the same lick, every tune he played. At the end of it, he'd have that one certain thing he'd do. He was really a great person. I met him when he was reading a script for the Bing Crosby show. It was for a radio show in San Francisco. . . When you toured the chitlin circuit, did you play in the Deep South? I played in Memphis -- I guess you'd call that Deep South. Was that during the Jim Crow era? Yeah. And also I played at Mahara College, the black college. That was the Deep South. Was it scary to travel through the South at that time? My father moved the family to Los Angeles when I was young. We had lived in Louisiana and Texas, and dad thought our opportunities would be better in California. Therefore I was aware of how things were in the South. We worked a dance in Nashville, Tennessee. The woman who ran the fan club was there, and during the intermission they wanted the whites to come down on the floor and dance with everybody. The people sponsoring the dance had a rope down the middle of the floor. For whites on one side, blacks on the other? Yeah! You understand. So somebody came to me and said, "Look at what is happening out here." So I went behind the curtain and looked, and there was this segregated deal. And I could tell that the Cau-casian kids who were on the balcony wanted to come down and dance on the main floor. They wanted to dance with everybody. I asked the road manager about it, and he made some flippant remark. I always had a terrific temper, and he told me to quiet down and just play the gig and get out of there, and we did. . .
Did you enjoy recording "Silver Threads" with Carlos Santana? After "S.K. 's Blues," what were your most popular records? "I've Had My Moments" and "Why Was I Born." Do you have a collection of your own 78s? During your career, did any musicians give you good advice or look out for you? I'd look out for myself, and I'd look out for other musicians. You were the paternal figure? Yeah! I guess you could call it that. Did wanting to be with your children figure into your decision to leave the road? Oh, sure. San Francisco is a weird city, a wicked city, and I wanted to be there with them. You started playing for the church during the 1970s? Was there any problem with bringing an electric guitar into church? None whatsoever. They liked for me to bring it in. They use them in most Pentecostal churches. Yes. Once a week on Sunday, the Sabbath. Once I get there for the church service, there's a certain calmness, a certain serenity, that I don't get any place other than the church. When did you give your last blues performance? Were you playing blues at the club in Sunnyvale where you worked during the '70s? Seeing all the charts and lessons you've saved through the years, it's evident that music has been a lifelong journey for you. Yeah. I've loved my life. Do you still play much today? You know how some-times musicians try to copy their heroes note for note? What would you encourage a younger musician to learn from you? I'd like for them to learn music. thanks to B.B. King, Jo and Kitsaun King, and Debbie and Carlos Santana for their gracious assistance with this article.